Pair of floor vases, Ch’ien Lung period (1736-1786), Canton. Gibson House Museum. 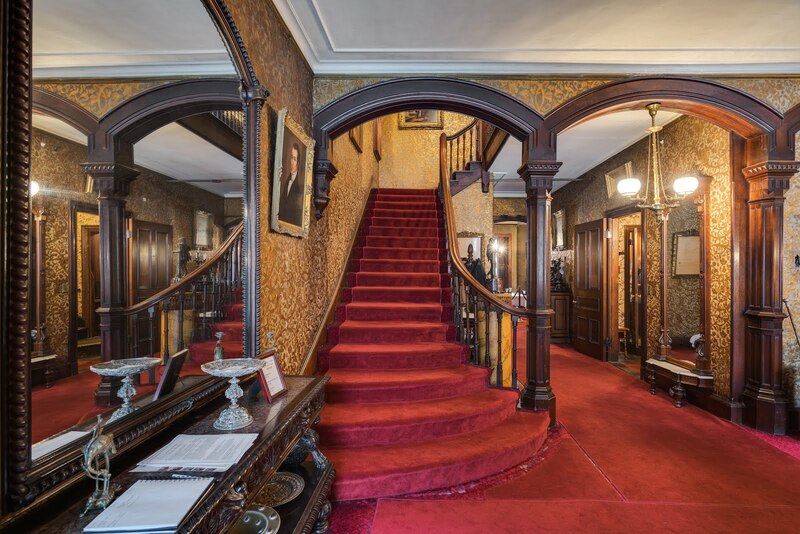 So begins Charles Gibson Jr.’s tour of the music room, written in 1939 soon after he started to think about his childhood home as a museum to Victorian culture and society in Boston. 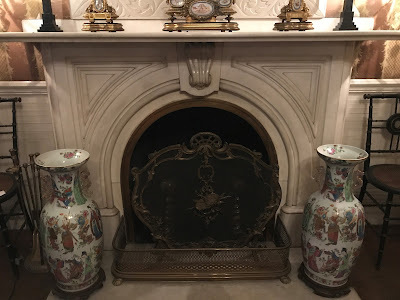 Those Chinese porcelains that get top billing in his tour are a collection of eight matching pieces: two garden seats, two flowerpots, two jardinières (flower stands), and two floor vases. 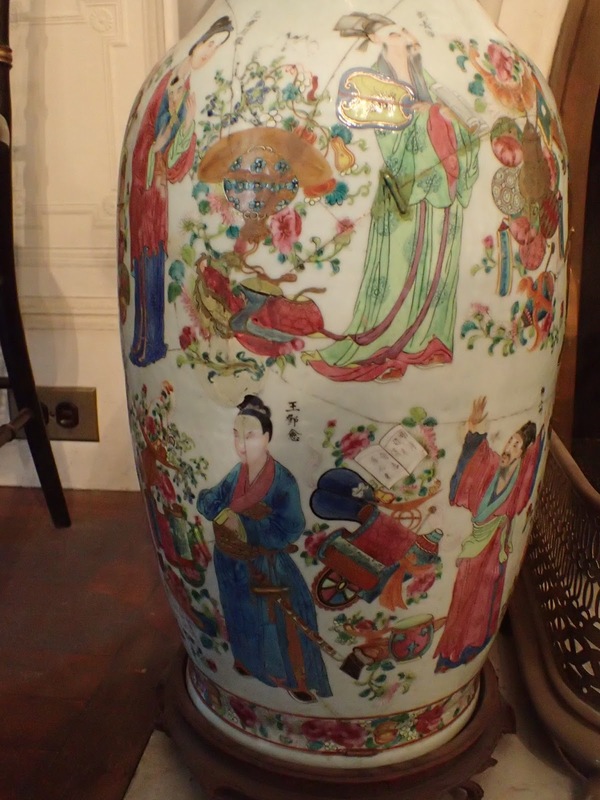 The pieces are decorated with floral designs and Chinese figures; the color palette, known as “famille rose,” is dominated by shades of pink and red. Over two feet tall, the floor vases, or palace vases, flank the fireplace. They are a focal point in a room filled with treasures. The vases were made in the port city of Guangzhou, known in the eighteenth and nineteenth centuries as Canton. According to Charlie, they were made in the Ch’ien Lung period, 1736-1786. Emperor Ch’ien Lung was a patron of the ceramic arts, and during his reign, new color palettes were introduced, including the “famille rose” colors seen on these pieces. Porcelain wares made in Canton were manufactured specifically for the export market. Chinese emperors had confined all western trade to this one city, which made it a bustling and international marketplace. The China trade was built on Chinese exports of tea and silk, but luxury goods, like porcelain “china,” were also a hit with American consumers. 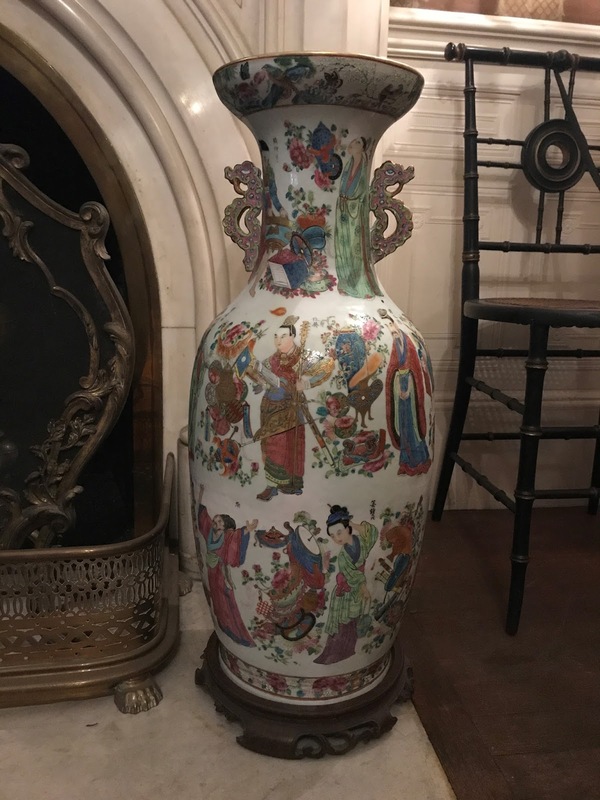 In fact, “chinoiserie,” or decorative arts inspired by Chinese artistic traditions, had been fashionable since the mid 1700s, and owning China trade pieces, especially ones as large (and therefore, expensive to ship) as these floor vases, continued to be a status symbol into the 1800s. Charles Gibson, Jr. (Charlie), with his great-aunt, Mary Ann Palfrey Russell. The porcelain vases passed through Miss Russell to Charlie’s family. 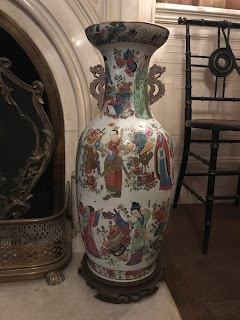 In his tour, Charlie goes on to say he “inherited many of the Chinese porcelains in this room – these were brought over to this country from China about 1835 for Mr. Nathaniel P. Russell… .” The China trade, which flourished in the United States between the end of the American Revolution and the First Opium War (1839-1842), made many Bostonians quite wealthy. One of those Bostonians was Charlie’s great uncle, Nathaniel Pope Russell. He was a prominent Boston citizen, and a leading China trade merchant and marine insurance broker. His son, Samuel Hammond Russell, eventually purchased the house at 135 Beacon Street, directly next door to the Gibson House. 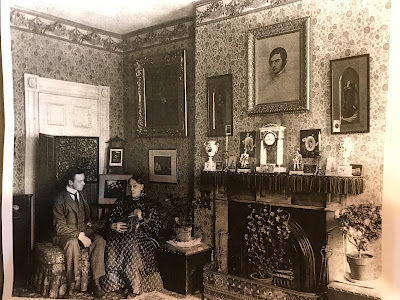 The families were quite close, and it was through this connection that Charlie ultimately came to own the collection of porcelains. The music room was a formal sitting room, where family and guests would retire after meals to listen to music, of course, performed by the Gibson children or by friends and guests, and to socialize and spend time together. Because it was a public space, the room was decorated to show off the family’s wealth, taste, and social connections. And this is exactly what Charlie is reminding us of when he points out these once-trendy Chinese porcelain pieces. Floor vases, before and after restoration. The floor vases have been off view for over a year and we are so thrilled to have them back. Stop by the Gibson House to see the complete collection of Chinese porcelains that Charlie was so very proud of. The Gibson House Museum Archives. Accessible by appointment.